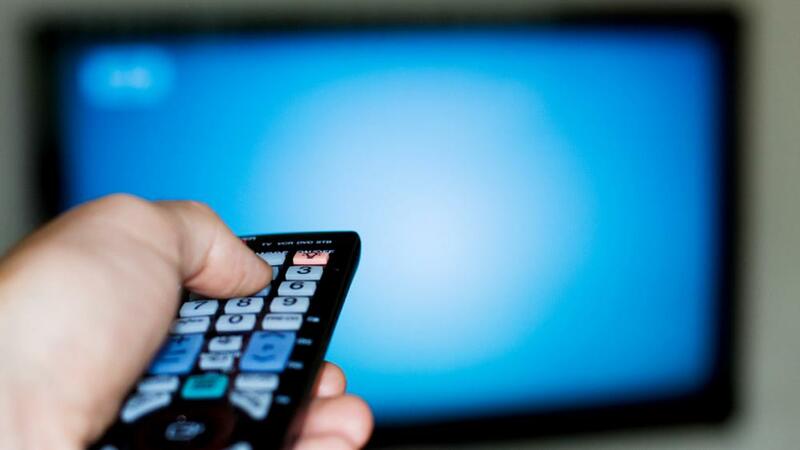 According to Nielsen’s latest Cross-Platform report that studies how content is consumed, the average amount of live television watched each day has dropped by approximately two percent over the previous year. 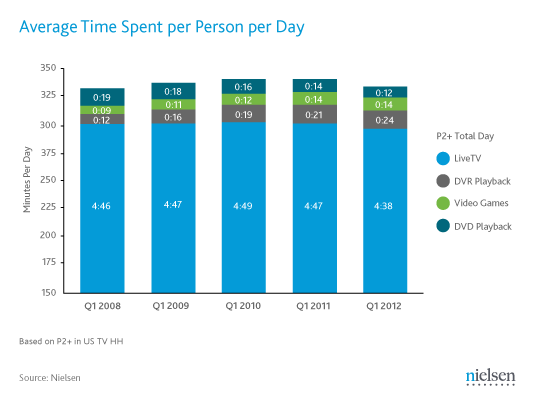 Alternatively, the amount of time spent watching content recorded on a DVR has increased by approximately eight percent over the same time period. In addition, the number of people watching television programs over the Internet on a computer or streaming shows on a mobile smartphone has increased year-over-year. Regarding physical media, the amount of people watching DVD or Blu-ray discs decreased slightly over the same time period and video game usage remained the same. Specific to age, older adults were vastly more likely to spend more time watching live television than younger adults. 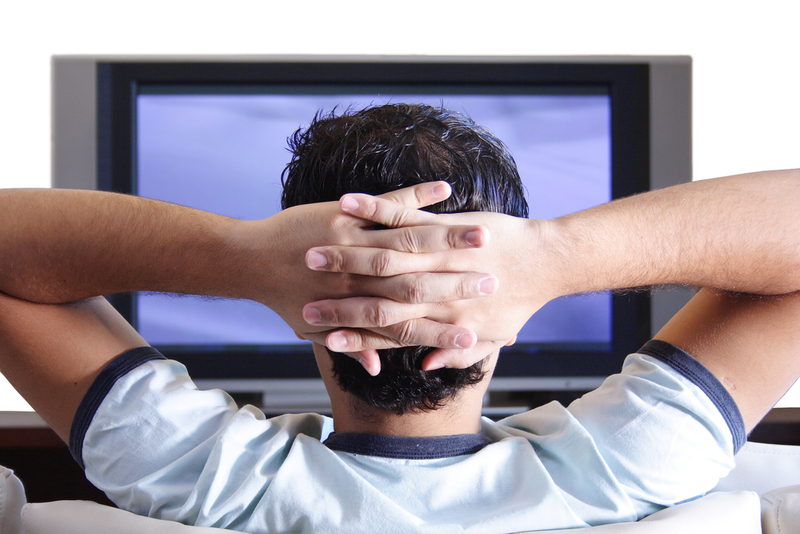 Men over the age of 35 spend approximately five and a half hours per day watching television while women of the same age range spend a bit over six hours. The younger 18 to 34 year old demographic spends about three and half hours watching television on the male side and slightly more than four hours per day on the female side. DVR usage was highest among adults between the ages of 35 to 64 while watching video on the Internet was most popular with young adults between the ages of 18 to 34. When it comes to watching video on a mobile phone, children between the ages of 12 to 17 and young adults between the ages of 18 to 24 were the most likely to watch programming on their smartphone. Regarding ethnicity and race, African-Americans consumed the most traditional live television with an average of 210 hours per month while Asian-Americans watched the least with an average of 100 hours per month. When it comes to cord cutting, the amount of people that are subscribing to cable television has dropped by about five percent year-over-year. Television service through satellite or telecommunication companies has stayed relatively stable. Interestingly, the number of people that subscribe to broadband Internet service and only watch broadcast television over-the-air has increased over the past twelve months. Regarding home theater hardware, the amount of DVD or Blu-ray players used in U.S. homes decreased by nearly three percent while the amount of DVR devices has increased by nine percent year-over-year. In addition, the amount of high definition televisions within U.S. homes increased by nine percent and video game console market penetration also increased by three percent. Specifically, forty-six percent of U.S. homes have a gaming console and thirty-nine percent have a seventh-generation gaming console within the home. In addition, gaming consoles are getting more usage as an entertainment hub than a standalone DVD or Blu-ray player. Beyond simply playing games, PlayStation 3 owners spend an average of 36 minutes on the console each day for other entertainment like streaming video on Netflix, Vudu or Hulu Plus. In addition, Xbox 360 owners spend about 32 minutes per day on the console and Wii owners spend about 17 minutes on the console each day. Households that utilize a seventh-generations gaming console are more likely to have broadband Internet access, spend money each month on extra services and experiment with new electronic devices within the home.